It’s great to be back in Juneau. Last summer, I spent three and a half months at the terminus of Lemon Creek Glacier assisting Ph.D. candidate Carli Arendt with her research into the length of time water resides beneath the glacier. Carli and I are part of Dr. Sarah Aciego's Glaciochemistry and Isotope Geochemistry Laboratory (GIGL) group at the University of Michigan, where we are currently working on projects in ice core research, glacier and ice dynamics, dust transport, oceanography, and soils. The main objective of the Lemon Creek Glacier work has been to test a novel method for calculating residence time of subglacial water using uranium-series (234U – 222Rn) isotopes. 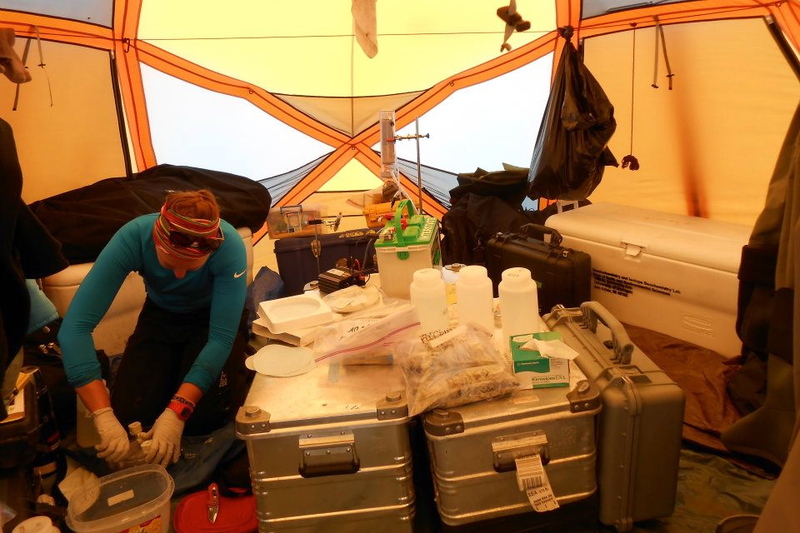 Our work at the glacier has since expanded as new students and researchers have become involved, and we are now examining how the isotopic signatures correlate to weathering and nutrient products (i.e. water-bedrock interactions) by measuring physical characteristics of suspended sediment and radiogenic strontium isotopic composition of meltwater. Last Wednesday, JIRP Director Jeff Kavanaugh and I flew up to the terminus of the nearby Eagle Glacier, where, using the same methods as last year, we were able to collect some preliminary samples to send back to Michigan. Due to the uncharacteristically sunny, hot weather they've been having here in Juneau, we weren't able to get quite as close to the terminus as we would have liked (the channel was seriously raging), but we made it work. All in all, we ended up with some pretty great weather and were able to accomplish everything in about two hours—just in time for dinner. Of course, strong winds coming off the glacier ensured that everything we ate for the next 24 hours tasted vaguely of glacial flour, which we are still trying to get out of our ears. I'm thrilled that I have the unique opportunity to revisit the Juneau Icefield and to observe landscape variations since my time there last summer. Plus, I'm told that JIRPers aren't prone to being dive-bombed by aggressive gulls, or waking up with mice crawling out of their sleeping bags, so those are certainly pluses. Bring on the snow pits!